Chris checks out The Framed Collection, a pair of winning Aussie mobile games that have made their way to PC and Switch. 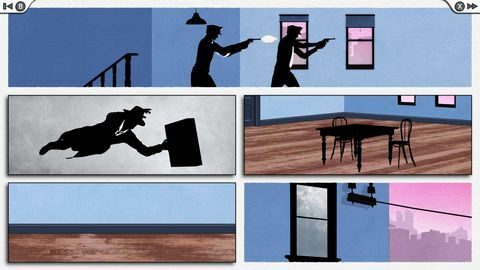 I first played Framed when it released a few years ago on the Google Play Store and absolutely loved it. It quickly became my favourite mobile game. I picked up the sequel when it released last year, and enjoyed it even more than the first. They are elegantly executed mobile games, that fully take advantage of the touchscreen interface. Both games have now been repackaged as The Framed Collection for PC and Nintendo Switch. As a fan of the mobile versions I was very interested to see how these wonderful little games fared outside of their initial release platform. So, with some hope, and a little hesitation I fired up The Framed Collection on my Switch. Unsurprisingly, the games look essentially identical to the mobile versions I have on my phone. This is certainly not a negative as both games are wonderfully presented using a minimalistic noir art style. The look of the pair is extremely clean, both using accented silhouettes for their characters and bold, well contrasted assets for the various scenes throughout. All of this helps to give the player a clear picture of what is being shown on screen, which is very important for a puzzle game of this type. 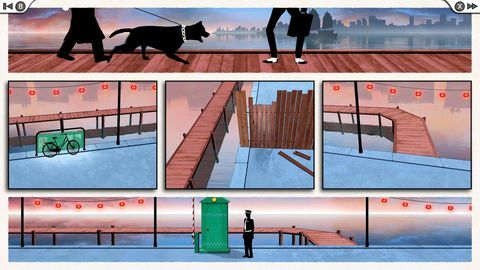 The world is broken down into a series of comic book style screens, and it is the player’s objective to manipulate each comic frame to allow our protagonist to traverse from frame one to the final frame on the screen. Mechanically, the game is very straight forward – rearrange frames to cause the events in the scene to trigger in the newly set order. This may mean moving a door to the start or the scene so our spy can exit early to avoid an enemy in an adjoining room, or changing the order of obstacles on a ledge to avoid a quick drop and a sudden stop. As you progress, the puzzles will become more complex, introducing colour cues, as well as a rotation mechanic, and different shaped frames that cause more complex order transitions. 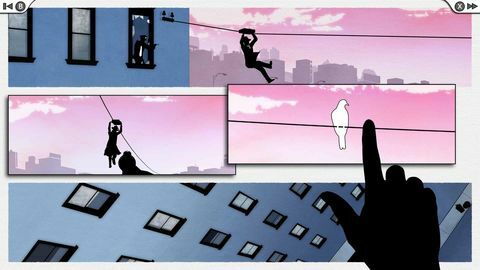 There are also puzzles requiring frames to be switched multiple times, and scenes where rotating a frame transforms the scene from one thing to another. For example, you might change a vertical wall into a floor, causing an in-frame item to reorient itself to gravity now pulling from a different direction. These variations and additions keep things interesting throughout, but even then there is a lot of trial and error that may frustrate some. As events trigger in the order you put them, outcomes can vary wildly from frame to frame. So, while the game’s internal logic is constant, some triggers only become apparent after experimenting with various frame orientations. You will seldom be able to work out the solution by just studying the static scene. 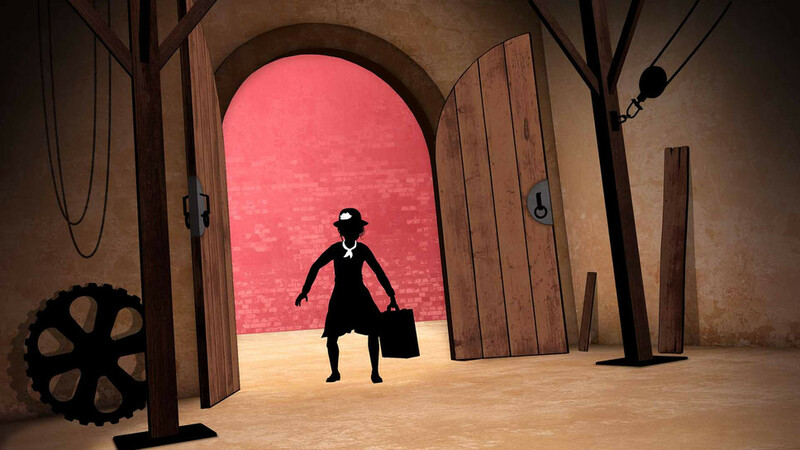 Discovering the correct order and seeing our spy play out the completed scene is always satisfying. There is also a fair amount of entertainment in seeing the various fail states for each and every scene. Some are very inventive and are occasionally genuinely funny. In some cases, I even found myself deliberately failing scenes to see what other disastrous outcomes I could bring to fruition. As someone who enjoys puzzle games, The Framed Collection is very easy to recommend, but that recommendation comes with a few very significant caveats. The biggest of these will be around the overall length. In the mobile space, games this level of brevity are not uncommon, but when moving to a new platform, perceptions change. The handheld and console space expects a little more meat on your game. You can complete each of the two Framed titles in less than an hour, if you know the solutions. Most players will take at least twice if not three times that time to reach the conclusion. My first playthrough of Framed took me about an hour and a half, Framed 2 around two. I do not think this length is at all an issue. The games are both well-paced and provide what I think is the perfect amount of content, but I also understand that for some their relative brevity could be a concern, and may make it difficult for some to see them as anything more than a mobile game and therefore not worth the money. I do not agree but understand the feeling. The other issue is the far more significant one. There is no value added with the release on Switch, it is in fact it is my least preferred way to play. Using the Joy-Cons is awkward at best, so Docked mode play is unwieldy and unpleasant, and worse than that, some scenes require quick rearrangements that are very frustrating using any sort of controller. For this reason, handheld is the only real option here, but it’s still far more pleasant and comfortable to play on a dedicated touch device like a smartphone. The extra weight and attached Joy-Con grips in handheld mode do not allow for the most comfortable gameplay for touch only games like Framed. Even with the Joy-Cons removed it never feels quite right on the Switch, which I found surprising. It is likely that the game fares better on PC when using a mouse, but I’ve not been able to play the PC version, so I am not able to comment on this. I really like these games, but they do throw up a couple of interesting questions about the viability of some mobile games on different platforms. The Switch seemed like the perfect option when looking to expand beyond iTunes and Google Play, but as it turns out, in some cases it’s a lot more complex than just porting them over. A great mobile experience may not translate to a great console experience, even a handheld console with touch capabilities. 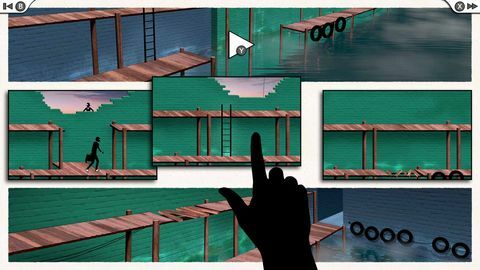 The Framed games are an easy recommendation to fans of puzzles games, but I think you’ll have a far better time playing the them on your phone than anywhere else. A pocket-sized noir adventure filled with genuine charm and challenge that doesn’t really feel all that comfortable on console. Ups Slick puzzles and an intuitive interface. Charming art style and sound design. Downs For a ‘console’ game it’s too short and limited in scope. The mobile version just feels better to play.